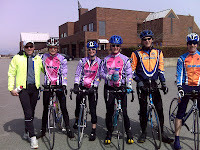 Yesterday the SAA headed out to Tswwassen BC for a group ride. Now that the weather has improve, we are seeing a bigger turn out. We ended up doing an 88km ride. This route is generally flat with a only 2 moderate hills. The winds were not very high but we did appreciate the draft of being in a group. One of our riders had her longest bike day EVER! Congrats on a huge milestone. Left to right: Larry, Ann, Me, Fay, Marinus and Brian. Here is the route we took. hey, just got back from a relaxing 4 mile run as I try to taper and I heard you on the RRT, good job. Proof that my marathon training is effective. I cried at work today. I am emotionally and physically worn down. To make room in my garage for a my new road bike, it is time to let my Orbea Onix move to a new home. This is a fantastic bike for the new or experienced cyclist looking for a full carbon road bike at good price. After my minor breakdown at work on Friday, I set off on Saturday for Sechelt. I have run the April Fool's Half Marathon two times and this was my third time. It never fails to be hilly and hard. Sunday morning I started off at in Gibsons ready to run to Mission Point Park. I took it very conservatively knowing that I would be adding another 15kms on at the end of the 'race'. I crossed the finish line, collected my medal, filled my water bottles, ate a piece of bagel and a bite of banana and kept running west. I do not recommend running your longest run before a marathon in Sechelt if you are not used to hills. That place is full of 12-15% grades both up and down. At the end of the day, I ran from 9:17am - 2pm with a few quick breaks to refill bottles, eat gels and take few rocks out of my shoes. After a shower and some real food, I was back on the ferry to North Vancouver. Reward: White Spot Legendary Burger combo with cheese and a Coke.